The seventh day of the Counting of the Omer – making one week – begins Monday night. It is the festival of the eighth day of Passover for those who observe eight days. Among Moroccan Jews and others in Israel, this is Mimouna, a day on which families celebrate the end of Passover and welcome non-Jewish friends into their homes. It is the day of Malchut within Chesed, nobility within love. On this day, I am thinking about how my highest aspirations for myself are revealed in my relationships with others. I think about how I treat other people and what that reflects – or fails to reflect – about my values and standards. I consider what my behavior towards others when I am angry, upset, anxious or distracted says about who I am. On this seventh day of the Counting of the Omer, I make a commitment to strive to be my best and most noble self in all of my relationships. I also think about being noble in the way I treat myself, remembering that there is nothing honorable about beating myself up for every mistake I make, or for every fault I perceive within myself. Whether you celebrate Mimouna or not, I hope you draw inspiration from a noble practice of showing love and friendship to non-Jews. There is nothing more noble than recognizing and accepting the things that make us different from others and responding with respect and compassion rather than rejection and fear. The fifth day of the Counting of the Omer begins Saturday night. It is the day of Hod within Chesed, humility within love. On this day, I am thinking about reducing the size and burden of my ego in my loving relationships. I think about how ego can get in the way of truly seeing other people and how humility allows me to be more genuine and compassionate towards people I care about. On this fifth day of the Counting of the Omer, I make a commitment to back away from inserting my desires and my opinions into the conversation when I am listening to another person's experiences and perspective. I also think about treating myself with humility, allowing me to really appreciate my true self – not the identity I create out of the needs of ego. May this be a day for you that opens your heart to love patiently, deeply and humbly. The fourth day of the Counting of the Omer begins Friday night. It is the day of Netzach within Chesed, endurance within love. On this day, I am thinking about the ways that I can make love last. I think about how love is about commitment, showing up, and making it work even through tough times. I consider how I can be a better friend by thinking about long-term commitment rather than short-term expediency. On this fourth day of the Counting of the Omer, I am determined to do the hard work of relationship building by caring for people during tough times, being there when I am needed, and not giving up on people when I perceive them to be "difficult." I also think about not giving up on myself, but treating myself with compassion and care even when I feel disappointed in myself. May this be a day for you that strengthens your determination to make love last. The third day of the Counting of the Omer begins Thursday night. It is the day of Tiferet within Chesed, balance within love. On this day, I am thinking about finding the right balancing point in the way I treat other people. I think about being compassionate and caring toward others, but also using judgment and discretion. I consider how I can be a better parent by being loving toward my children while also exercising discipline and enforcing appropriate boundaries. On this third day of the Counting of the Omer, I make a commitment to be loving even in the moments when I need to be tough, and being judicious even when I am being caring and loving. I also think about being balanced in the way I treat myself – knowing the point at which self-criticism becomes self-abuse, and the point at which self-love becomes narcissism. May this be a day for you that makes your love stronger by being balanced. This is the first day of the Counting of the Omer. Starting on the second day of Passover, and continuing until the holiday of Shavuot, we count the days and weeks of the Omer. The mitzvah originates in the Torah (Leviticus 23:15-16) and was originally associated in ancient times with the barley growing season and harvest. A full seven weeks were counted until barley sheaves (Omer in Hebrew) were brought to the Temple as an offering. Throughout Jewish history, the Counting of the Omer has gone through many different interpretations and meanings. The rabbis associated this time of year with a plague that was said to have struck the students of Rabbi Akiva in the second century C.E. The "plague" may actually have been a euphemism for the unsuccessful Bar Kochba rebellion against the Romans in which more than a half million Jews were killed. In the Jewish mystical tradition, the Counting of the Omer was reimagined as a period of spiritual purification in preparation for the revelation of the Torah on Shavuot. According to this interpretation, each week of the Counting of the Omer is associated with one of the seven lower sefirot. In Kabalah, the ten sefrot are divine emanations. Each of them can be compared to a vessel that contains an aspect of the shefa (flow) of God's presence that connects heaven and earth. • Chesed. Love, compassion and forgiveness. • Gevurah. Strength, discipline, justice. • Tiferet. Beauty, balance, equanimity. • Yesod. Foundation, connection, grounding. • Malchut. Kingship, nobility, aspiration. 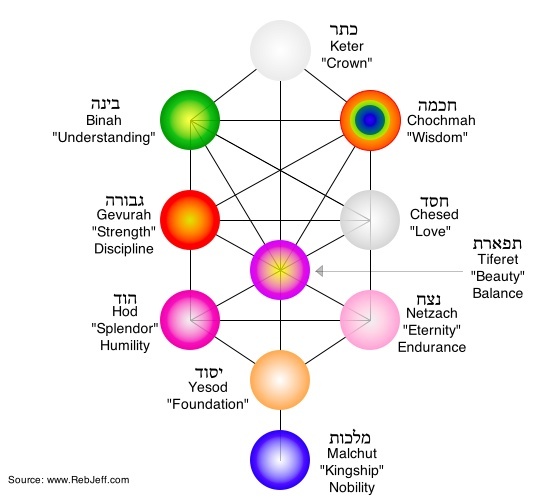 Here is a version of the traditional diagram of the ten sefirot. Each day of each week is also associated with one of the seven lower sefirot, making each day of the Counting of the Omer a day for contemplating a unique pairing of qualities and spiritual capacities. The first day of the Counting of the Omer begins on Tuesday night. It is the day of Chesed within Chesed, love within love. On this day, which is also the second day of Passover, I am thinking about the people in my life who I love – my family, friends and members of my community. I think about the way I love them and how to make that love shine a bit brighter. I consider how sometimes other things get in the way of loving people the way that I want to love them – anger, obstinance, wanting to be "right." On this first day of the Counting of the Omer, I make a commitment to do a better job of loving the people I care about by letting love be love. I think about being better at loving others by being better at loving myself and exercising compassion for myself for my faults and shortcomings. May this be a day for you that makes your love shine as brightly as it can. This is what has stood for our ancestors and for us. For not just one has stood against us to wipe us out, but in every generation they have stood against us to wipe us out. Yet, the Holy One of Blessing saves us from their hands. On the eve of the festival that celebrates the Season of Our Freedom, we are once again reminded that the world is far from being the place we dream it could be. At tonight's seder, we'll sing a song about how "in every generation they have stood against us," and we will think about yesterday's events in Overland Park, Kansas. The song, though, should not be an occasion for bemoaning our lachrymose history or railing against the way the Jewish people have been (and are) victimized by antisemitism. Instead, hear the words of the song. "This is what has stood for our ancestors and for us." In the context of the Haggadah, "this" refers to the covenant between God and the Jewish people. "This" is also our ability to stand above the fear and hatred that fills this sphere and to make our purpose about something higher. We are the people of the covenant, and that means that, no matter what others may do to us, we will persevere because of our loyalty to the belief in redemption. We were made for a world that is better than this. We will mourn for the dead in Kansas and offer comfort to their families and to the survivors. We will aid a community that has been devastated by tragedy. And we will go on hoping for, and building, a better world. In short, we will uphold the covenant. That, ultimately, is the power that saves us from the hands of destruction. Tonight begins Shabbat HaGadol, the Shabbat before Passover whose name means, "The Great Sabbath." It is reasonable to ask why this, of all sabbaths, would have the distinction of being called "great." The most common explanation comes from the last verses of the special haftarah reading of this day. The prophet Malachi says, "Behold, I will send Elijah the prophet to you before the coming great and awesome day of Adonai. He shall turn the hearts of the parents to the children, and the hearts of the children to their parents, lest I come to strike the land with destruction" (Malachi 3:23-24). Traditionally, the first of these two verses is repeated after the last, so the reading in Hebrew ends with the words, "The coming great and awesome day of Adonai." So, if this is the reason for the name of this Shabbat, we call it "great" because it reminds us that God's redemption is not yet complete and there is still a "great and awesome" day to come. On that day, Elijah the Prophet, the herald of redemption, will "turn the hearts of the parents to the children and the hearts of the children to their parents." What does that phrase mean? Passover is a holiday that is all about redemption. We remember how God redeemed Israel from slavery in Egypt. Yet, in the Haggadah, the rabbis constantly emphasize that the redemption we experienced at the Red Sea is only a provisional redemption. There is still an even greater redemption that we are waiting for – one in which the entire world will be redeemed. Based in part on the verse from this haftarah, the rabbis made Elijah the symbol of that promised and as-of-yet unfulfilled redemption. The large cup of wine that sits in the middle of our seder table is not called "Elijah's Cup," as many suppose, because the prophet will silently and invisibly come drink from it during the seder. Its meaning is far deeper than that. On an evening when we drink four cups of wine to represent the four promises that God made to the Israelites, Elijah's Cup is the fifth cup. It is the cup from which we cannot yet drink because the promise has not yet been fulfilled. What is that promise? It is that "the hearts of the parents will turn toward the children, and the hearts of the children will turn toward their parents." The coming redemption, the great one that we still await, is that there will be reconciliation between generations. The world will not be fully redeemed until older people, who think they have seen it all, identify with childhood's sense of wonder and are able to look at the world as the shining, new-in-every moment place that it is. The promise will not be fulfilled until children deeply appreciate the wisdom of a received tradition that instructs them in how to live a life of meaning and joy. Is that all it takes? Yes. When the nations that have fought for generations are able to look at each other the way children look at each other, then we will be able to hold each others hands in peace. When children are taught to find love and joy in ancient traditions, not confinement and rebuke, then there will be an end to resentment and rebellion. The message of Elijah the prophet, in the prophecy of Malachi and in the symbolism of the seder table, is that redemption will not be delivered to us from on high, rather, it is held in the human heart. When we open to each other and see each other for the beautiful, brand new, ancient and splendid beings that we are, that is when the final promised redemption will come. May it be soon and in our days.